Flipkart’s The Big Billion Days sale is almost upon us and we are expecting a boatload of smartphone deals to be offered during the sale. Xiaomi is also joining the festivities and has today announced an eye-grabbing deal on its best-selling device, the Redmi Note 5 Pro. 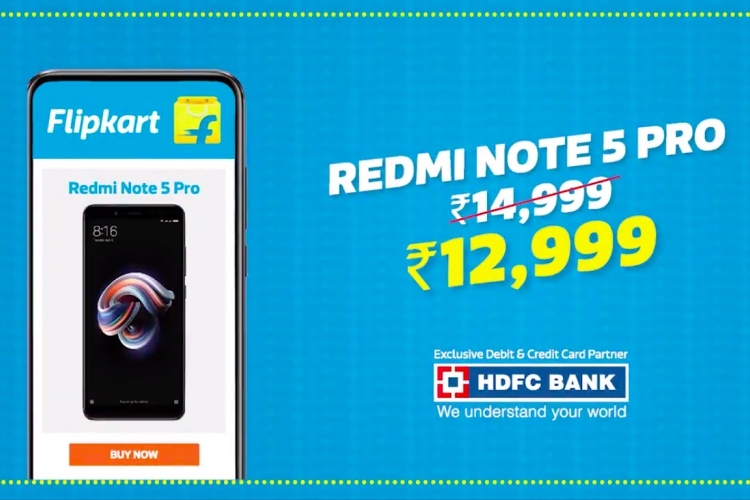 Announced via an official tweet, Xiaomi India head Manu Kumar Jain and Flipkart CEO Kalyan Krishnamurthy revealed that the Redmi Note 5 Pro has been discounted by Rs. 2,000 for the Big Billion Days sale. This means you will now be able to pick up the device for an effective price of Rs 12,999 as compared to its usual Rs 14,999 retail price tag. In addition, Flipkart is offering HDFC credit and debit cardholders an additional 10 per cent discount over the effective price during the sale event. You can also choose to pick up Complete Mobile Protection Plan (now with mobile insurance) and Assured Buy Back plan for Rs 99 each with the Redmi Note 5 Pro. With such an impressive offer, Xiaomi is gunning to take on its primary competitor, the ZenFone Max Pro, in the entry-level segment. Asus and Xiaomi are going to be butting heads during the Flipkart Big Billion Days sale event.